Jeff is the Senior Global Trade Counsel at HPE, a multinational enterprise information technology company. 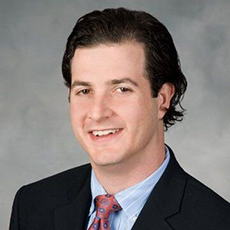 Based in the Washington, DC area, Jeff has broad experience in import, export, and sanctions laws and is the attorney in Hewlett Packard Enterprise’s Office of the General Counsel providing legal counseling and support for the company’s international trade compliance responsibilities around the world. Prior to joining HP, Jeff was a member of the International Trade & Regulatory practice at Alston & Bird LLP. Before practicing law, Jeff worked as a strategy consultant in the Washington, D.C., office, of Kaiser Associates, Inc., where he advised industry-leading clients on a variety of corporate strategy issues, including global supply chain strategy. Jeff earned his J.D., with honors, from The George Washington University Law School, as well as a M.A. in International Affairs from George Washington University’s Elliott School of International Affairs. He completed undergraduate studies in International Studies at Emory University.